A unique combination of moisturising Body cream and Hydrating gel, this product has been formulated to add high levels of hydration to the skin and locking it in for extra protection and moisturisation. A unique blend of Tea Tree Leaf, Lavender Flower and Geranium Flower essential oils contribute to the calming and soothing effect. 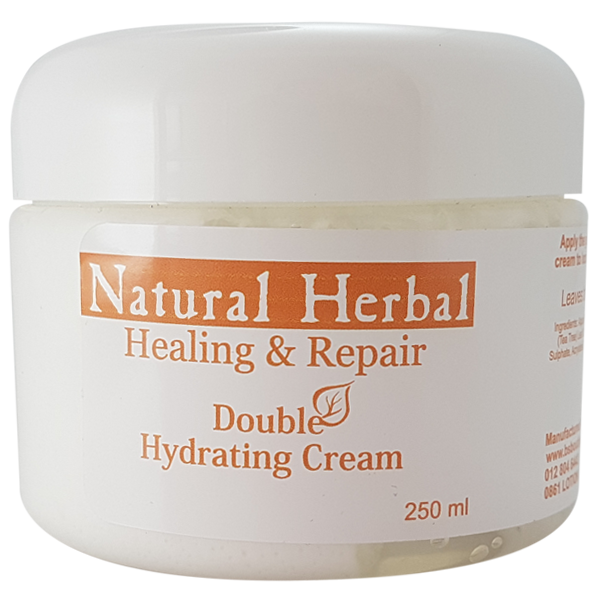 Healing & Repair Range Double Hydration Cream is uniquely designed to soothe and heal the skin. It contains Tea Tree Leaf Oil which is known for its antibacterial, antifungal and antimicrobial properties, thereby contributing to the healing of broken skin. As it also has strong antioxidant properties, it protects the skin from free radicals reducing the visible signs of ageing. Furthermore it is a sudorific which means it helps draw toxin out through the skin. Lavender Flower Oil is known for its calming and soothing effect, reducing inflammation and relaxing the skin. Geranium Flower and Rosemary oils are known to have astringent properties, which help in tightening the skin, by inducing contractions in muscles and blood vessels. Apply the gel all over the body for boosted moisturisation of the skin and follow with cream to lock in the moisture. Leaves skin feeling soft, smooth, refreshed and glowing.